Stranger in a Strange Land: Chris Brahney Is Missing In Manchester, UK - Have You Seen Him? Chris Brahney Is Missing In Manchester, UK - Have You Seen Him? Police underwater divers are to search the boating lake at Heaton Park as part of the hunt for a 22-year-old man who went missing after Friday's Stone Roses concert. 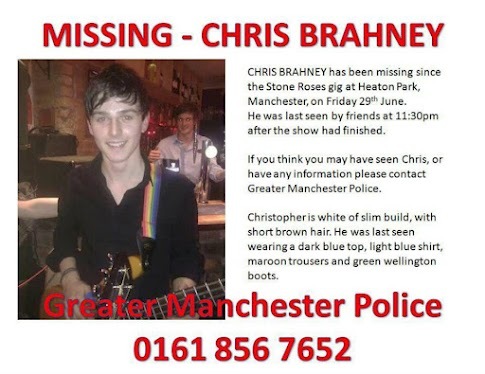 Chris Brahney went to the show with friends and was last seen after it ended at about 11pm. Chris' family have made a desperate plea for help to find him. His dad Stuart, from Timperley, Altrincham, described how Chris had lost his phone during the night and has not been in touch since – leaving the family desperately worried. Stuart, 56, said his son had never gone this long without being in touch before. Detectives are now investigating the disappearance and more than 3,000 people have joined a Facebook group called ‘Help Find Chris Brahney’. Stuart, a quantity surveyor, said: "We’re very up and down. To be honest it’s a struggle but we’re supporting each other and the support we have had from Chris’ friends has been tremendous. "Like all young men and women Chris would go out, stay out with friends for a night and come back the next day, but it has never been on this scale before." Stuart said his son, a barman and massive music fan, was excited about the Stone Roses gig when he left the family home at about midday on Friday. Chris, a former Wellington School pupil, was supposed to be doing a shift at the Altrincham bar where he works today. Stuart said: "I’m just hoping he walks through the door at any moment. We have to stay positive, it’s the only thing we can do. There’s no mileage in considering any other option than Chris walking through the door. I suppose every parent thinks their child is unique but Chris is an extremely affable and likeable individual. "If anyone has any knowledge related to his disappearance please contact police immediately. We just want Chris’ safe return." Chris is white, slim and has short brown hair. He was last seen wearing a dark blue top, light blue shirt, maroon trousers and green wellington boots. Anyone with information can call police on 0161 856 7652.